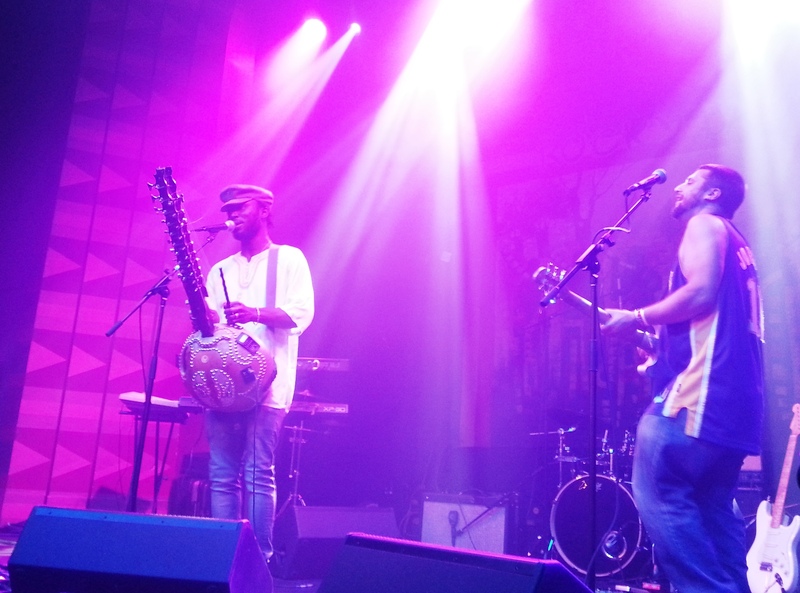 Angelenos who stayed local for the 2015 Memorial Day Weekend were in for a rare treat of West African music in downtown LA, with the trifecta of renowned Ghanaian reggae artist/activist Rocky Dawuni, Joe Driscoll and Sekou Kouyate (bridging New York, the UK and Guinea), and KCRW DJ Glenn Red all under one roof at the Regent. Each set was thoroughly engrossing, evoking blissed-out movement from the crowd, and the night just kept getting better. The Regent features a roomy dance floor that slopes down gradually toward the elevated stage, where the artists jammed out to a shifting kaleidoscope of colorful spotlights. DJ Glenn Red warmed up the night with soulful, reggae-infused grooves, pumping up the vibe with Ivorian group Magic System‘s “1er Gaou” just before yielding the stage to Joe and Sekou. This duo’s uplifting musical mélange frees hips and feels thoroughly engaging. The unlikely, creative union of the classical sound of the kora, a West African relative of the harp, with hip hop elements of rapping and beatboxing, reinforces the message of music as the universal language. Joe and Sekou were brought together by festival organizers when neither spoke each other’s language, but through music, they found a powerful and lasting connection and eventually landed on world music label Cumbancha. Sekou deftly conjured a rise of sweet, lilting string notes from his kora, while Joe played guitar and rapped in occasionally very rapid-fire style. Sekou also sang in his native Susu and accentuated some of Joe’s refrains in English, while Joe returned the favor by singing some backup phrasings in Susu. Their stylings ranged from reggae to a laid-back pop feel to more intense rock, all with tuned-in energy, expansive smiles and strong rapport between these “brothers from another mother.” The duo was backed by their solid rhythm section with drummer Jimbo and bassist John, both hailing from the UK. Their songs touch on equality, “just living,” and the joy of playing music. Joe stated, “Some things feel so good – the embrace of your lover, a sip of that red wine, but for us nothing feels as good as being onstage. We play one hour for every 12 hours of travel –” but the Faya (their recent album title, meaning ‘fire’) created through music and connection makes all the long travel days well worth it. They performed “New York,” a tribute to Joe’s home state, though he’s also lived in Berkeley, CA. He worked some call-and-response from the crowd, surmising that although on the west coast, there seems to be lots of love for New York. And while Angelenos do have love to give, we are still competitive, and I had to wonder how the energy compares when the song is received in New York. On a personal note, I nearly had the chance to find out when I’d planned to attend a concert of Joe and Sekou’s in New York earlier this year – which maddeningly wound up being cancelled due to visa issues. Such frustrations with borders are also reflected in Joe and Sekou’s catchy song “Passport,” about their love for traveling and touring versus the political headache of obtaining visas. Joe sings, “You know it’s only you, you see / Who has made the boundary.” So being previously deprived, it felt all the more triumphant to revel in Joe and Sekou’s singular sound, after first being enthralled by their music last year at Grand Performances. They closed the set with the politically charged “Womanati,” speaking against corruption and inertia, teasing out the ending for a resounding close that left the dance floor pulsing with energy. Joe and Sekou play tonight, May 24, 2015, in Berkeley, continuing on to Seattle and Portland. Cumbancha label mate Rocky Dawuni further elevated the night with a large ensemble of performers onstage, including guitar, bass, drum kit, congas, trumpet, saxophone, and three backup singers/dancers in colorful batik, with orange and blue-patterned flowing skirts. Rocky commanded the stage with his warm presence, long flowing dreadlocks and strong rapport with the crowd. His songs ranged from mellower hand-waving songs to more energetic jumping and dancing ones, culminating with “African Thriller,” the hit single from his new album Branches of the Same Tree. With this album, Rocky further serves as a unifying force across African, Caribbean and American cultures and generations. Rocky performs tonight, May 24, at Lightning in a Bottle. He will grace the stage at Grand Performances in Downtown LA on August 1, and at the Levitt Pavilion Pasadena on September 19.